It is crazy winter in Prague this year. Instead of snow and freeze we have warm weather and sun. If you would like to see pictures of Prague with snow, you have to wait or poke my old photos. 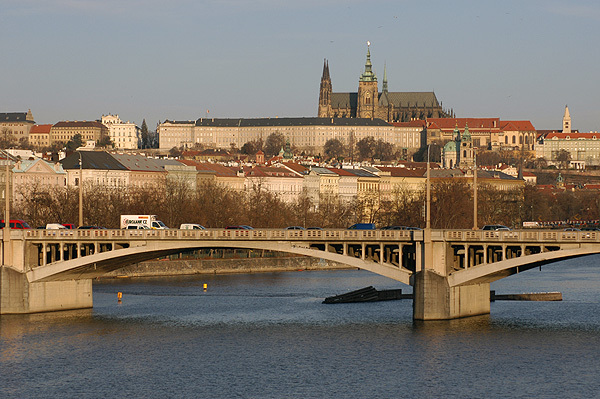 So, here is picture of Jirasek Bridge (Jiraskuv Most) across Vltava River lit by the colourful winter sun. At the top of the picture you see panorama of Prague Castle with dominant of St. Vitus Cathedral. Just above one of Jiraskuv Bridge pillar you can also find baroque Church of St. Nicholas. This photo was taken in the morning from Palacky Bridge (Palackeho Most). Posted: Praha, Jan 13, 09:14 by Czech-man. I’ve been in Prag 2 years ago and it is a very beautiful city. Btw nice photo and good lightning conditions. Greetings from Vienna, Stephan!